Each new year brings with it plenty of new things — new trends, new friends and, most importantly, new music. Once again, Exclaim! 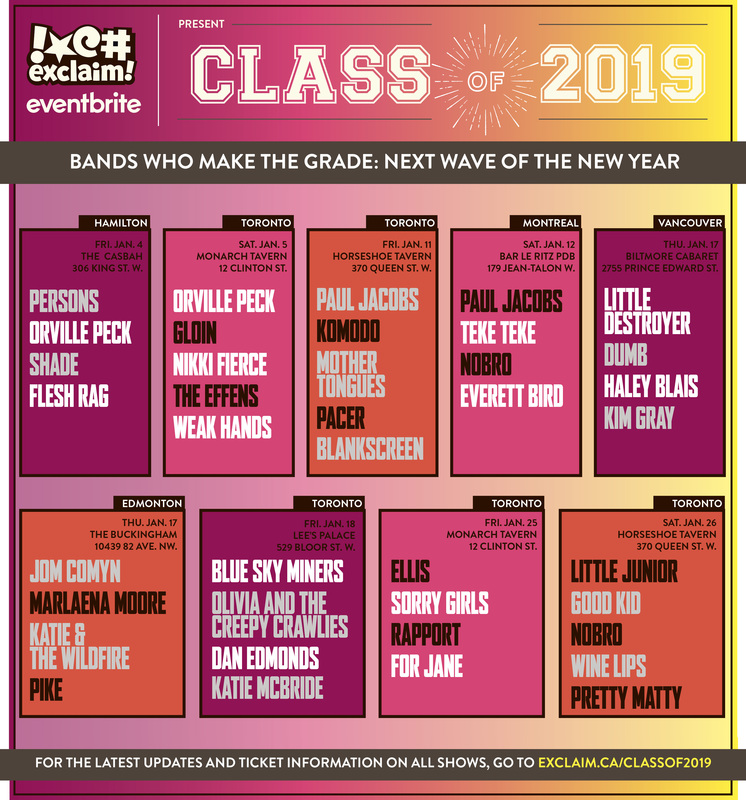 is teaming up with Toronto concert promoter Dan Burke and Eventbrite to present the Class of 2019 concert series, featuring some of Canada's best acts that are poised to break out this year. As with last year's series, the Class of 2019 will be taking place all across the country. In addition to five shows in Toronto, there will be shows in Hamilton, Montreal, Edmonton and Vancouver. The series kicks off at the Casbah in Hamilton on January 4 with an eclectic evening featuring genre-blending performance art crew Persons, psych cowboy Orville Peck, and local rock'n'rollers Shade and Flesh Rag. The following night (January 5), Orville Peck will head up an evening of fuzzy rock at Toronto's Monarch Tavern alongside locals Gloin, Nikki Fierce, the Effens and Weak Hands. Then, on January 11, art rock reigns supreme at Toronto's Horseshoe Tavern with performances by Montreal's Paul Jacobs and locals Komodo, Mother Tongues, Pacer and Blankscreen. The next night (January 12), Jacobs heads home to Montreal, heading up a showcase at Bar le Ritz PDB alongside Eleki/shoegaze fusion troupe TEKE::TEKE, pop-punks NOBRO and psych rocker Everett Bird. On Thursday, January 17, the Class of series heads west for the first time for a double-header of shows. The Buckingham in Edmonton will feature a solid blend of pop, rock and folk courtesy of Jom Comyn, Marlaena Moore, Katie & the Wildfire and Pike. That same night, Vancouver's Biltmore Cabaret will play host to synth-pop trio Little Destroyer, post-punks DUMB, YouTuber-turned-popster Haley Blais and garage popster Kim Gray. On January 18 at Lee's Palace in Toronto, things will get lush and folky with performances by Blue Sky Miners, Olivia and the Creepy Crawlies, Dan Edmonds and Katie McBride. The final weekend brings two last concerts to Toronto. January 25's showcase at the Monarch Tavern will feature rising dream popsters Ellis and Rapport, along with Montreal synth popsters Sorry Girls and Toronto alt-rockers For Jane. The Class of 2019 wraps up on January 26 at Toronto's Horseshoe Tavern with power pop courtesy of Little Junior, Good Kid and Pretty Matty, along with NOBRO and psych-tinged outfit Wine Lips. Keep your eye on our Facebook page and the Facebook events for the latest updates. Check out the listings below for more information and ticket links. Marlaena Moore "24 Hour Drugstore"